The winter months can be criticize skin; the cold weather and acerb winds can sap critical wet from your skin, leaving it feeling dry, listless and crying out for extra aliment and care. What ameliorate way to beat the cool than with the edition Dove Winter Care range which has been fondly created to winter-proof skin from cold spells leaving it protected and pampered all season long. With its revolutionary Abstruse Care Complex it contains a blend of caring ingredients including skin-natural nutrients and rich essential oil, designed to provide the essential nourishment skin needs to stay beautifully soft and smooth. 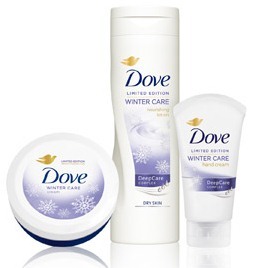 Winter Care Nourishing Body Wash helps ensure skin is kept moisturized and protected right from the start of your day With the Limited Edition Dove Winter Care range we’re certain that it will help your skin will stay smooth and protected, so you can look and feel amazing whilst enjoying the festive season!